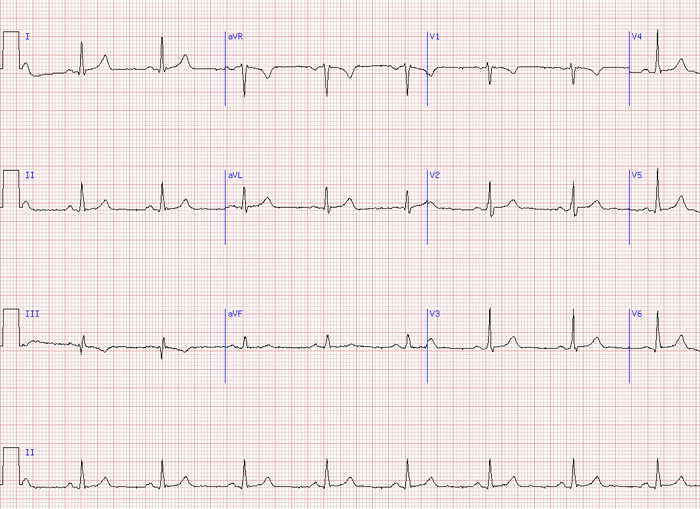 What is the rhythm shown in the ECG? Normal Sinus Rhythm is the term used for the characteristic normal rhythm from a healthy human heart. 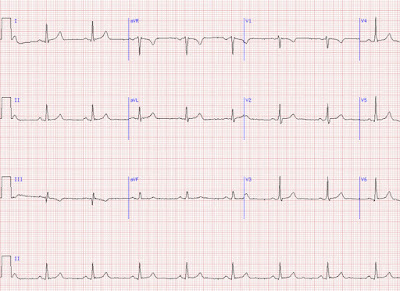 The rhythm is generated from the sinus node and the rate is regular. All the other measurements in the ECG also fall within the normal ranges leading to a characteristic appearance of the ECG indicating the electrical and conducting system of the heart is functioning normally. Normal heart rate (classically 60 to 100 beats per minute for an adult). Regular rhythm, with less than 0.16 second variation in the shortest and longest duration between successive P waves. The sinoatrial node should pace the heart – therefore, P waves must be round, all the same shape, and present before every QRS complex in a ratio of 1:1. Normal PR interval, QRS complex and QT interval. QRS complex positive in leads I, II, aVF and V3-V6, and negative in lead aVR.